I'm so proud to share this Snowman Suncatcher with you today as it was created by my clever kiddo! 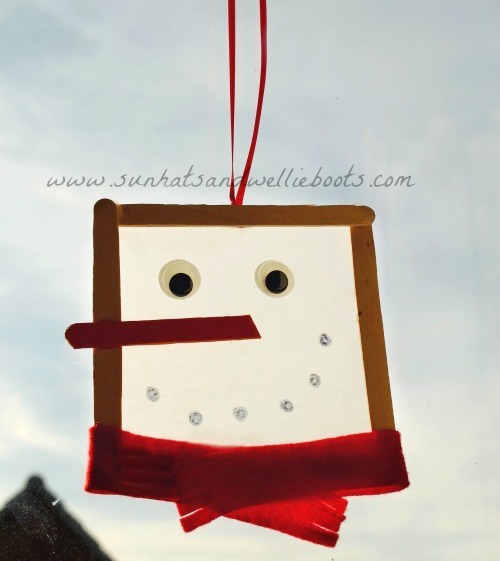 After crafting with a bunch of lolly sticks she came up with this neat craft which looks just gorgeous hanging on the window with the Winter sun shining through. 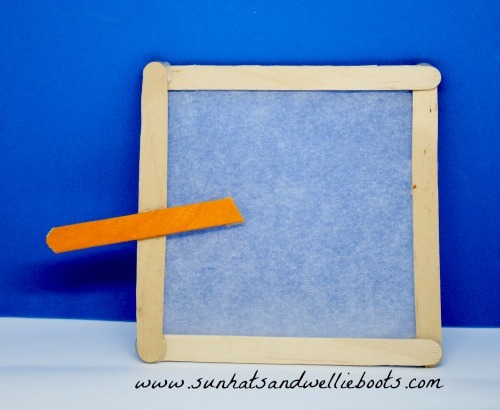 I love watching children's creativity flow with the simplest of materials, even the most basic items can be transformed into something amazing with just a little imagination. Who would've thought 5 lolly sticks would make such an cute seasonal decoration. To create this simple Snowman Suncatcher Minnie attached 4 lolly sticks together with a glue gun to form a square. She coloured in the last lolly stick with an orange pen to make a carrot nose & cut it in half before attaching it to the side of the square. Such a neat idea & so effective! For the snowman's face Minnie cut a section of white baking paper the same size as the stick frame & carefully glued it to the back. 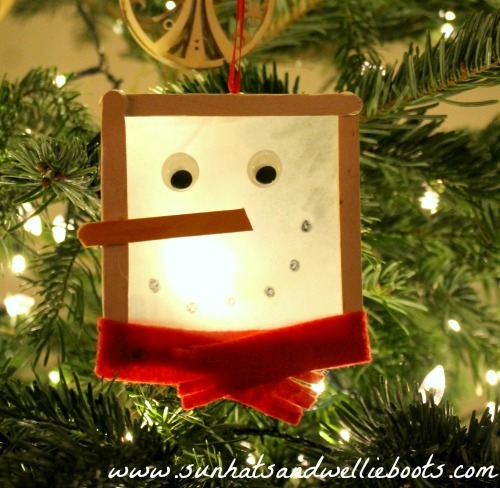 As the paper was semi-transparent it gave the snowman a real frosty appearance as the light shone through. She then attached a couple of googly eyes to the baking paper & added a pebble smile using a sharpie marker. 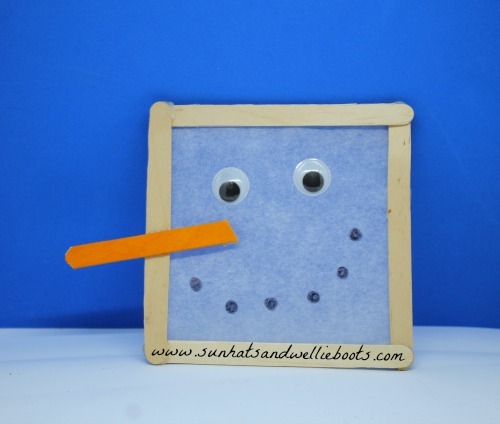 Now in my opinion this snowman is very cute just as he is, but add a simple felt scarf to the base & he looks perfect. To enable our snowman to hang in any window we glued a length of ribbon on the frame & this frosty snowman was ready to go! ...and our Christmas tree! They do look especially beautiful illuminated by all the sparkly fairy lights twinkling around them, & the shadows produced by the tree branches create magical ice-like patterns on the baking paper. We'll soon be taking our Christmas decorations down but we'll be keeping these cute suncatchers up for the rest of the Winter to add a little cheer when all the other ornaments disappear until next year. 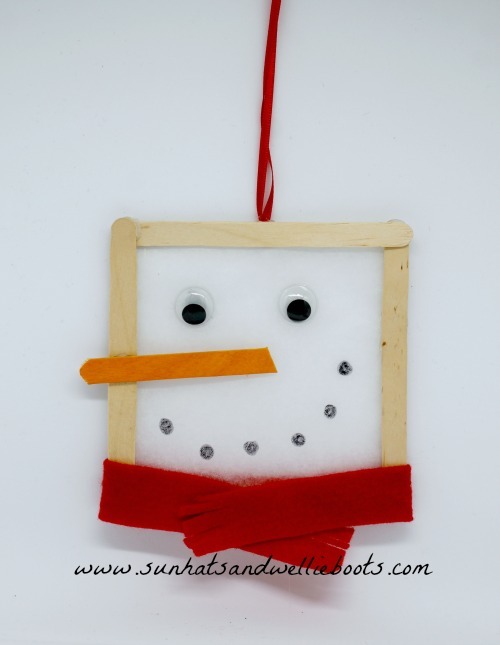 Looking for more Winter crafts & activities?